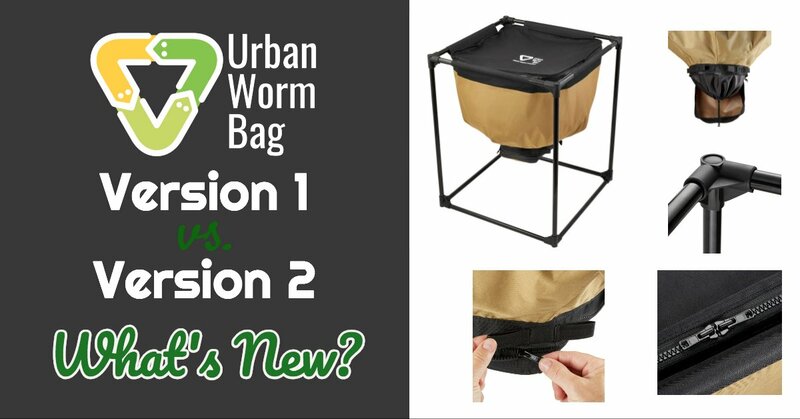 Firstly, thank you to all of my existing customers who trusted me enough to purchase Version 1.0 of the Urban Worm Bag. 2018 has truly been a blessing so far. I have enjoyed my interactions with you and receiving your feedback about what you loved about the Urban Worm Bag. And almost without exception, your negative feedback has been both friendly and incredibly constructive. While most users have reported superb results, some customers have had some issues that I knew needed to be fixed in Version 2. Ultimately, it’s just good business and the right thing to do to acknowledge the potential issues and fix them ASAP with my subsequent shipments. This includes honoring the warranty on the Urban Worm Bag. More on that later. Once I observed the difficulties some users were having, I knew I needed to make a change. So below, I will detail some of the issues with Version 1 and then show you the changes I made with Version 2! Some users reported difficulty in opening and closing the bottom zipper. I thought my choice of heavy duty nylon coil marine-grade zippers would mitigate this problem, but the muck of the vermicompost was sometimes too much to handle, especially in hard water areas like Texas and Arkansas where calcifications would build in the teeth of the zipper. Also, pulling a zipper on the Bag while it is suspended on the frame can also be awkward as the Bag will often just sway in response to the pressure. This problem is made worse by keeping a bin that is too wet. For users that found excess moisture escaping through the bottom of the Bag, this eventually led to a binding of the zipper, which made both opening and closing difficult. Even in my own Urban Worm Bag, which I grossly overwatered in order to put it through its paces, I found that my zipper was unacceptably tough to open and close after a few months. Fixing this was Priority 1 for Version 2. This was a completely unanticipated problem as I didn’t fully appreciate the wide range of spaces where users were going to place the Urban Worm Bag. I made the mistake of assuming users would place the frame on a level surface. But the Urban Worm Bag is big and, well, people have to put them wherever they can fit them. This includes utility closets, basement floors, and porches, which are often naturally pitched to allow proper water draining. The problem is that gravity will always pull the bag part of the Urban Worm Bag straight down, but the frame will tilt in the same direction as its underlying surface. This results in a distinct bending or twisting force on the plastic connectors, which frankly weren’t built to withstand that kind of torque, causing them to warp or crack. The leaning frame could also place very uneven weight on the fabric tunneling where the Bag attaches to the frame. Some users reported the tunneling partially or full tearing away from the Bag. So while the changes I made to Version 2 should help this problem, one thing I need to do a better job of is informing customers that the frame must be kept level. And keeping it outside in your yard exposed to uneven terrain, but also to the elements is a bad idea. Some users reported some difficulty in harvesting castings because there is not much room between the Bag and the floor in order to harvest. This is even more true when the Bag slightly stretches under a heavy load. It would probably help to give you a little background on this problem. In this case, the Bag is 22 inches deep, which is pretty much the minimum depth I wanted for a continuous flow-style system like this. I wanted about 8 inches below the Bag to allow for harvest. This isn’t that much but it’s also the best I could do given the need to limit the overall height, which I describe below. Version 1 is about 30 inches tall. But in order to make the Bag appreciably taller, I would have had to also increase the width as the center of gravity would have become unacceptably high. At 27 inches wide, the Urban Worm Bag is already wide enough! Version 2 is going to feature an interior drawstring enclosure which is going to perform several functions. First, it will protect the zipper from sustained, direct contact with the vermicompost as well as any excess moisture, helping to prevent the grit, calcifications, and overall zipper bind ups some users have experienced. Second, it will further ease the harvesting process in several ways. Assuming the zipper opened smoothly, users would normally just open one corner of the bottom zipper to harvest, which meant vermicompost was being pulled out over the teeth of the zipper. The interior drawstring enclosure (closed with a barrel lock) will allow direct harvest from the Bag directly to a container below without touching the zipper. While it would be unusual for moist castings to simply flow out the bottom of an open Urban Worm Bag (even with a fully open bottom! ), users can easily control the flow of castings by only partially opening the barrel lock on the interior enclosure. If better airflow is needed at the bottom of the Bag, users can just keep the zipper bottom open if they so choose and keep the bottom closed with the drawstring only. This is easily the most important change to Version 2! While under normal circumstances on a level surface, the Version 1 connectors should suffice. However, I felt I needed a better-engineered solution. So I had a mold created with corner reinforcements and thicker sidewalls to help prevent warping. However, these connectors will still not counteract the significant twisting force described above. So it remains necessary that the Bag with the frame be installed on a level surface. If this is not feasible, I also sell the Urban Worm Bag without the frame for significantly less, allowing you to create a sturdy frame to withstand uneven surfaces. I have even created plans that you can use as a basis for your frame! While it’s not a huge difference, Version 2 of the Urban Worm Bag is about 2 inches taller than Version 1. I hesitated to do this initially because increased height only makes the frame leaning problem worse on an uneven surface. Also, this would make feeding the Bag a little more difficult for shorter customers. But I felt comfortable making it a bit taller with both the beefier plastic connectors along with a commitment to educating customers to go for the Bag Only option if they needed to install the Urban Worm Bag on an uneven surface. And the double zipper (see below) will make it easier for shorter folks to feed the Bag without worrying about opening the zipper completely. I wouldn’t have anticipated this being an issue, but sure enough, it was! Some folks, especially those shorter more vertically-challenged types, had some issues reaching over the top of the frame and completely unzipping the top of the Urban Worm Bag. So I added a double zipper on top, meaning a user could open the Bag from any side. This is especially useful for people who keep the Urban Worm Bag in a corner. This way, they can open the top of the Bag from whatever point on the Bag they choose. This will be a small, but useful change. As the bag part of the Urban Worm Bag is suspended on a frame, the force of pulling on the bottom zipper (especially when it was sticking) would often just make the Bag sway on the frame. With a sticky zipper, this problem was even worse! Adding small nylon fabric loops will give the user some leverage to pull against when opening the zipper. This might be a case of overkill as the zipper issues should be mitigated by the new interior drawstring enclosure, but in the event of a sticky zipper these fabric loops may come in handy! I’m very happy with the quality of the products that I have inspected with this last shipment of Version 2. 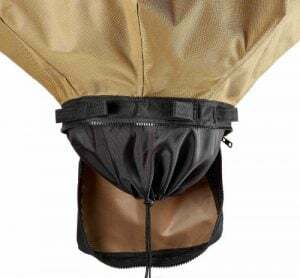 The interior drawstring enclosure, stronger connectors, the fabric loops, double zipper, and the increased height will all make a noticeable difference in terms of ease of harvest. But as Version 1 was not perfect, Version 2 may not be either! So if you’re an owner of either version and are unhappy with either product, please let me know! I am committed to bringing a quality product to market and want to make things right! You have a lifetime warranty, and a right to use it. And just so you know, any new Urban Worm Bag sales on urbanwormcompany.com or urbanwormbag.com will be Version 2 unless explicitly stated. Thanks again to all customers, past, present, and future! Do you have any questions, concerns, or comments? E-mail me at steve@urbanwormcompany.com.